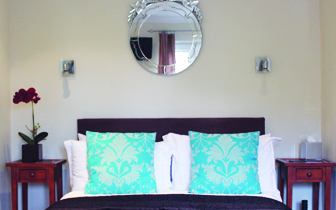 The Old Stables | Bed & Breakfast is situated in a quiet lane in the Heart of St Margarets. A beautiful location to stay for leisure or business within the Richmond borough. We are located on a quite lane in the heart of St Margarets. A perfect location for the attractions of south west London with Richmond Park and Town, Kew Gardens, Hampton court, Orleans house, Ham house, Strawberry Hill’s Horace Wapoles gothic castle, Twickenham stadium all within a few miles with great public transport links. A great base for exploring Surrey and London. Our Studio apartment is located on the first floor with double bed and single sofa bed for the 3rd guest. 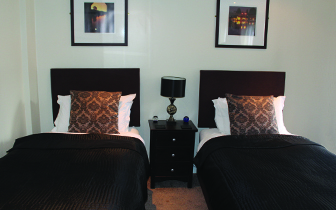 Our twin room is located on the ground floor with a separate entrance. 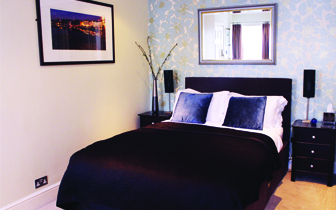 This room is located on the ground floor with a double bed and en suite shower room. 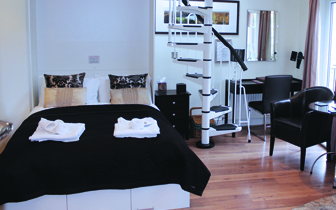 This room is located on the first floor with double bed and en suite bathroom. Thank you once again. As one of your biggest fans, I look forward to being back soon! The Old Stables is now a much loved part of the lives of me & y closest friends, in fact staying here has started to feel a bit like staying with a close friend without ever having met!